Find Hope at the end of a rainbow. 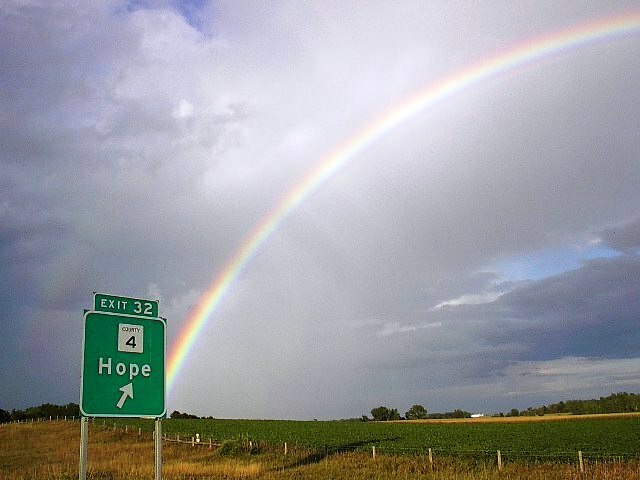 In Minnesota, you'll find Hope off the I-35 & CTY 4 HWY exit North of Albert Lea! Concerned folks sometimes ask us what to say to bereaving pet "parents." The beginning of this page deals with that topic. When some think of pet loss, they might simply think of a "pet" dying. There are different forms of loss. No matter how it occurs, the pet’s human guardian may experience intense reactions as a result. Some unknowing people fail to take pet loss seriously, some lack emotional depth, others choose to avoid thinking too hard. It keeps their life simple. It's easy to understand how one can grow closer to their pet than the people around them. Pets provide a form of selfless affection and non-judgmental existence rarely found anywhere. Our companions don't voice complaints, they're happy to see us and greet us when we return. They help center us, keep our sanity balanced and remind us about what is really important, Love. Coming from outside this relationship, one rarely understands the unique bond that forms. Some folks may think people who grieve over a pet's death, strange. They are quick to tell you to, "get on with your life." They cannot understand how one can become so attached to a dog, cat, bird, or other pet. Anyone who has had a pet for any length of time knows how painful it is when that beloved pet is lost. We are often left with questions, anger, guilt, or an overwhelming sense of loss that we are sometimes unable to cope with. Out of fear of being put down or ridiculed, many animal lovers keep their feelings suppressed, they keep their grief to themselves. They may experience distress, anxiety, guilt, depression, sadness, loneliness, and other unpleasant feelings for some time. If they are in isolation with their bereavement, this is generally not healthy. How you talk to them about their feelings and reactions can make an important difference in their lives. Very often, sharing these feelings with others who will understand is the first step toward healing. Discussing the feelings and realizing we are not alone helps us find strength and solace. If you are close to someone who has lost a pet help console those who need it with your own experience with loss. The healing process can begin by cherishing our favorite memories of our pets and recalling them with fondness. It allows the pain to start to diminish and gives us permission to continue to love and concentrate on those still with us. Adopt an attitude that conveys you are taking the mourner's experience seriously. Do not make assumptions on how you think the mourner is feeling or reacting. Simply demonstrate interest and concern. Listen and speak with empathy, understanding, support, sensitivity and compassion. Share stories from your own experience. Let them know you welcome their fond memories of their animal friend. Ask how the pet got his or her name, and encourage them to tell you how the pet became a member of the family. Refrain from asking if the mourner is planning on getting another pet, or suggesting where such a pet might be found. A pet owner might feel offended by this despite any good intentions in asking. Minimize the use of clichés such as telling the mourner that time heals all wounds, or reassuring them that they will soon "get over it." Send the mourner a condolence card. Some are specifically made for pet loss, if it seems appropriate. Write a thoughtful line or two (or more) on the card, in your own words. This will probably be very much appreciated. Write down the dates that are important to the bereaved pet owner, like the dates of the pet's death, birth, adoption, etc. Consider sending a follow-up note, e-mail, or card, or making a telephone call to the mourner in remembrance of these special days. Send a donation, in honor of the deceased or lost pet, to an animal-related organization (such as a humane society, animal shelter, or one devoted to improving the health of animals through medical research). After a few weeks or months, follow up by asking the bereaved individual how she or he is doing in his/her mourning process over the loss of her/his pet. Realize that the mourning process, as with people's responses to the death of human loved ones, can be multi-layered and highly complex. Keep in mind that everyone is unique, with her/his own needs and preferences. Good judgement is essential in dealing with people in such a vulnerable state. Encourage the mourner to talk to a professional if their grief is prolonged or especially intense. Psychotherapists who specialize in pet loss counseling provide a supportive, compassionate, and knowledgeable presence to anyone grieving the loss of a pet. Take care of your body. Your body is the container of the mind which is now feeling intense emotion. Nurturing it will help ease your grieving process. Nutrition: eat healthy meals even if feel your appetite is reduced. Sleep: be sure to get at least 5-8 hours daily. Exercise: even walking will help your mood in this difficult time. Talk to those people who can empathize with your grief, spend less time with those who can not. Consistent interaction and sharing with those you feel comfortable around will be most beneficial. Maintain structure in your life. Continue to do the activities you did before the loss. Do not allow this major disruption to snowball into every aspect of your life. Structure helps your regain your bearings. Perform a ritual when you feel the time is right. Some have funerals at a pet cemetery or memorials with friends and family. Others may create a small shrine for a time. Allow yourself to feel sadness and loss. Experience it, take some time out of your schedule. Go sit in a park near the river or by the lake. Listen to the wind. Grief is a normal response to a normal occurrence, yet we all experience differently. Some of us need more time than others. Respect that idea. If you feel as though you cannot recover, or it you have thoughts of self-harm, contact a mental health professional immediately.